Gamers and cryptocurrency speculators are now able to buy limited-edition weapons for use with upcoming mobile augmented reality (AR) combat game, Reality Clash – with early activity having lifted the value of RC coins by an incredible 380% in the first 24 hours of trading. The game’s publisher, Reality Gaming Group has opened an online store – the Reality Clash Armoury – that allows users to browse a list of guns, render each in a 3D view and then buy them with RCC Gold coins, the Reality Clash in-game cryptocurrency. In the first 24 hours of the store opening, 50,000 Reality Clash Gold (RCC Gold) coins had been spent by gamers and investors, with 75% of the initial limited-edition stock of weapons having sold out. The store opening is a landmark moment for the global video games market, with Reality Gaming Group becoming the first publisher to raise money via an Initial Coin Offering (ICO) and then successfully deliver a product in which investors can spend their cryptocurrency. The initial set of guns are available to buy in a variety of unique cryptocurrency skins, such as a Bitcoin machine gun or an Ether sniper rifle, amongst others. Each week two new guns and skins will be released and announced across Reality Clash social channels. As the initial weapons are all limited editions, once they are sold out they will never be released again. Lucky buyers of these weapons will be able to trade or sell them to other players via the Armoury Store’s trading platform, launching in a few months, or keep them for in-game tactical advantage when the Reality Clash game launches in late 2018. Crucially, all purchased weapons will be ERC-20 tokenized, which means that – unlike some hugely popular games that use a trading mechanic – the players own the virtual items they buy, rather than the game’s publisher. They can then sell or trade Reality Clash weapons and exchange the RCC Gold into fiat currency such as Euros or sterling – Gamers can make real cash. The Reality Clash Armoury online store is complemented by a companion Android mobile app that uses the phone’s camera to render the guns in an AR view of the world on-screen, allowing users to test fire the weapons before they make a purchase. An iOS version of the companion app is set to follow. Reality Clash is an augmented reality FPS combat game for iOS and Android devices set in an underground world of cryptocurrency and hackers. Players will be able to connect to friends in real-time using geo map technology, join private teams and enter tournaments. Morten Rongaard, Reality Gaming Group Co-Founder, said: “We were absolutely thrilled with the level of participation in the Reality Clash ICO, and now we’re even more excited to embark on the next stage of that journey – the opening of the Reality Clash Armoury. 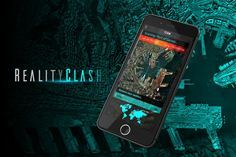 More information about Reality Clash and its Armoury can be found at http://realityclash.com.